“Make love not war”, is probably an adage appropriate for warring factions but when war is over trade, even the most peace-seeking investor might be tempted to love the trade in the war i.e. pursue opportunistic and strategic gains. One would think that the issues underlying trade spats grabbing headlines these days are resolvable by well-intentioned, rationale minds but it is easier said than done with conflicting political agendas and personalities of multiple interest groups. What is projected as trade, is really geopolitics of China on one hand and NAFTA on the other with everything else in between. Repeating all the ho hum talks about trade tariffs and trade deficits here, is redundant though it’s important to recognize that the rivalry between the US and China was not principally about trade, but was really about China’s emergence over the last five years “as a formidable bidder for economic and political influence, an aspirant to technological leadership, and a major global investor” as noted by Gavekal Dragonomics in Hong Kong. 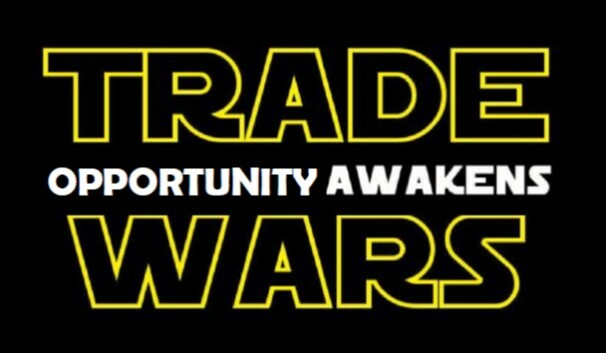 Fortunately, the powers that be decided that the trade wars be “put on hold” earlier this week, though tariffs are still likely to be used “as a negotiating tool or an enforcement tool”. Similarly, the NAFTA wrangling centered around a five-year sunset clause among other things such as US’s demand to bring wages in the auto sector up to North American median wages, threatens to diminish Mexico’s cost advantage over US auto workers. Though the jury is still out on where NAFTA ends up, left-leaning, leading contender AMLO, is generally feared to set back and even derail NAFTA talks if he won the July elections. The all-round uncertainty creates a war-on/war-off atmosphere which could be more unsettling than the risk-on/risk-off days (how we miss our benevolent central banks) making a conducive climate for relative value strategies that thrive on temporary dislocations across the board. But more astutely, it triggers a chain of events causing structural shifts that investors on-the-ground particularly in emerging markets (with whom ÊMA interacts regularly) are eyeing with pulsating curiosity. As elaborated in our last thought-piece, “A Chinese Menu for China”, there is no denying that China is out to leapfrog the West with innovation in e-commerce, biotechnology, semi-conductors, and artificial intelligence to create national technology champions. With a burning desire to achieve its end goal, temporary reprieves, and compromises (e.g. possibly allowing US firms to transact with ZTE) is probably not confidence-enhancing from China’s standpoint not knowing when and who’s next on the US hit list. As interpreted by local asset managers in China, this uncertainty is likely to “accelerate R&D and investments” in semi-conductors and the like by a concerted action between the government and leading corporates. So perhaps what was targeted in 5-10 years, will now be aimed for in 4-7 years to achieve self-sufficiency in semi-conductors. Acting on it, China is encouraging venture capital investments from Israel, a technology hotbed, (at the expense of US) with equal urgency to grow its local VC industry, second only to Silicon Valley, to fuel innovation. At least six Chinese tech companies have discussed investment opportunities with Israeli microchip makers (for applications in smartphones, super computers and cloud-based storage services) in recent months according to local venture capital firms. Exacerbating this trend is also an increasing pipeline of IPOs from unicorns valued at high exit multiples (e.g. Xiaomi, Didi Chuxing etc.). Notwithstanding its deep commitment to gain technological superiority, US’s actions, for good or for bad, have created pressures on China to reform laws and regulatory practices toward opening up its markets in technology, financial services, etc. without the hard and fast rule of technology transfers. From an investment standpoint, all this lends to more cross-border mergers and acquisitions (though in the face of rising protectionism and scrutiny) and accompanying private lending to this space to capitalize on financing shortfalls. This can’t be truer, with global tech powered firms importing their technological prowess to identify, understand and serve local demands especially of a burgeoning consuming middle class, in emerging markets. A striking example is the recent investment by Walmart (by scoring over Amazon) into India’s Flipkart, a trend-setter for other similar deals where trade restrictions could expedite the transformation of globalization to localization. This in turn births small cap industrials in ecommerce, logistics and process automation accessible through both public and private (equity and debt) markets. Similar trends to capture organic growth in an overall anemic growth environment, are noticeable in buyouts for control (upping minority stakes) across Asia led by the likes of SoftBank. This makes a compelling case for locally sponsored buyout/debt/venture capital funds in Asia with better deal flow origination, local networks and know-how, away from the large global funds that LPs have sought comfort with overlooking their mountains of dry powder and constricting deal pipelines. However, technology is less of a solution for commodities where nature dictates the law of comparative advantage. Soybeans is staple to China and any restrictions on its imports from the US, while creating stress for its farmers (though temporarily relieved by suspension of tariffs by China), could be an opportunity for Argentina if it can weather crop losses. Overall, trade restrictions coupled with maritime threats (e.g. South China Seas) when added to the vagaries of weather patterns, threaten agriculture supplies and bodes well for arbitraging agricultural commodities. Dislocation in oil supplies stemming from crimping flows from Iran and Venezuela due to imminent economic sanctions as also OPEC’s discipline to hold-off supplies, is already reflecting in the Brent/WTI spread toward yet another relative value play (rather than the more tempting directional bet). Off-limit drilling centers for oil majors, have diverted them to Latin America where Brazil and Mexico state-owned oil companies are welcoming them with drilling opportunities to shore up the fiscal health of their states. Similarly, trade tensions between China and the U.S are pushing South Korea to increase production capacity in Vietnam rather than China which has drawn many South Korean conglomerates such as Samsung, LG, Lotte, and Korean financial institutions to expand business activities in Vietnam. This creates positive momentum for Vietnam that deregulated retail, real estate etc. and recently received Fitch’s country upgrade as well as for its three state banks. Coalescing around each other is only likely to boost intra-EM trade that has grown significantly over the past twenty years with EM exports to other EM climbing from 25% of total exports to 40% (IMF) buoyed by both vast consuming populations (namely China, India, ASEAN) and infrastructure needs. This helps sustain economic growth even when “synchronized global recovery” turns dour (e.g. Japan, Europe, etc.). When instances like the recent resurgence of the dollar due to rising US treasury yields takes a toll on EM currencies (and EM local currency bond), a 20% depreciation of the Argentinian Peso against the dollar, while giving jitters to many DM investors, actually acts as a blessing in disguise to propel Argentinian exports to its closest trading partner, Brazil. In a similar vein, ~ $14 trillion trade would still thrive among the Comprehensive and Progressive Agreement for Trans-Pacific Partnership benefiting its 11 signatories from Japan to Chile (ex US and China) that remain committed to free (including digital freedom) and open markets among themselves. Mexico too would have access to six new markets for its exports, away from its major (80%) dependence on US for its exports which remain threatened under NAFTA. Thus, for all the talk about trade wars, developing nations seem potentially geared up to continue originating ~60% of global trade (International Chamber of Commerce) for destinations among themselves even if DM demand sours. If trade persists, so would the need to finance trade of manufactured goods and commodities, which remains largely unmet (most acutely in Asia) through traditional means. With regulatory restrictions like Basel III still dogging banks from lending to SMEs operating along the commodity value chains, it opens a lucrative opportunity (10-12% net unlevered IRRs) for niche private lenders to lend toward processing commodities into value-added products that can command higher margins, an important value driver going forward especially with macro growth declining (Bain-Asia Pacific Private Equity 2018). If the trading environment for goods is being redefined, EM countries are likely to manage their currencies (open to a risk of competitive devaluations) which is easier in a low inflationary climate though challenged by rising oil import bills. Also, emerging markets are overall much better positioned with stronger forex reserves, lower current account deficits, smaller dollar debt liabilities (ex Argentina, Turkey) than the dark days of taper tantrum to weather the onslaught of any dollar strengthening before darkening secular clouds (e.g. rising trade and fiscal deficits) burst on the US dollar. With lower imminent threats of rising local rates, bonds and equities in EM have one less headwind to counter. In fact, China’s stance to lower rates and loosen its purse strings to ward off any economic slowdown from trade tensions, is likely to provide fuel for its local markets though side-tracking it temporarily from its deleveraging mission. With the situation on trade wars still evolving by each passing day, it is quite difficult to drown political noises and adopt a soundproof investing strategy. However, it would serve well to remain nimble in a fertile trading environment that lends itself to relative value strategies. It would be equally prudent to invest for the longer term through private markets-debt and equity-into structural opportunities that offer good trade-offs for illiquidity. Who says you can’t make love in war? ÊMA continues to remain responsive to investors’ ongoing search for return premiums and is conducting independent investment audit on regional EM alternative specialists who can trade/invest around ongoing trade wars, nimbly and strategically to benefit LPs’ portfolios. Stay tuned.